In May 2009 „Zen-Sangha GenjoAn e.V.“ was founded by eight members of our Sangha. It was meant to support the transmission of the Dharma through Corinne Frottier Sensei. Ever since then the Sangha has been growing continuously. Participants, who feel at home in our Sangha and would like to practice Zazen under the guidance of Corinne Sensei, can become member of our association, if they wish to do so. 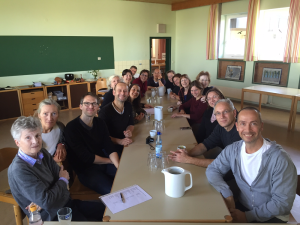 The association organizes Sesshins (meditation retreats that last a week or more) all over Germany.